In Sand to Stone and Back Again, I loved sharing my discovery of candy-cane columns. 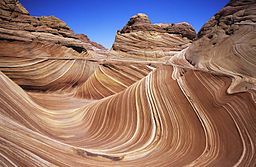 These striped sandstone creations would have been popular in December! Peek at a festive formation found in Nevada.